Mt. Kailash trek- A spiritual Tibet travel for travelers. Mt. Kailash trek (or Mt. Kailash Kora) is one of the demanding and challenging treks for numerous pilgrims in the world. Every year, pilgrims from all over the world throng to the mountain. The path around Mount Kailash is 52 km long. Many Tibetans do the Kora in a single day. But it is not easy for outsider travelers to finish the trek in such a short day because of the high altitude. Generally speaking, we suggest three days circumlocution based on a more acceptable speed. Here below are the itineraries about Mt. Kailash trek, may it can help you. The Mt. Everest trek begins on the western edge of Darchen. 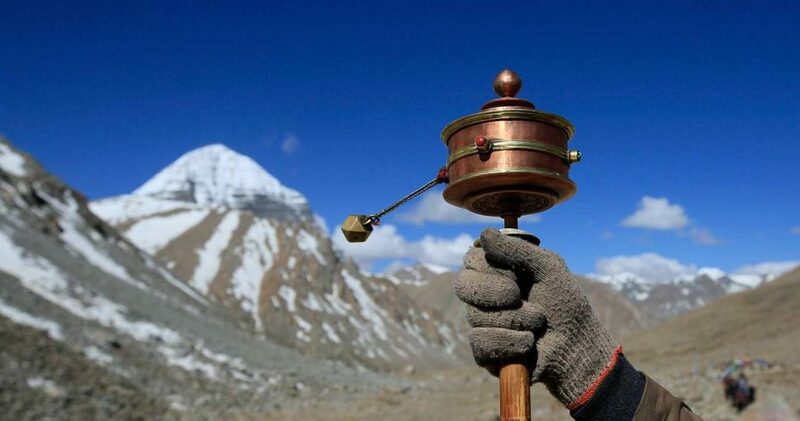 You will follow this ancient pilgrimage route with Indian Hindu and Tibetan Buddhist. During the Kora, the altitude will rise gradually, you may enjoy the gorgeous mountain at the same time. Such as barren valleys, long prayer walls, highly revered marble statue, etc. During the pilgrim season, a few nomad tents may be set up on the side of river. After 20 km trekking, travelers will arrive today’s destination Dira-puk Monastery, the altitude is 5,210 m. It’s possible to overnight in the monasteries. Tips: Eco-bus is available during the first 9 km, but it charges 60 RMB per person. Some tourists who can’t make the first 9 km trek have the option to take the vehicle. The most challenging and difficult stage of the three stages. Travelers start the second stage from Dira-puk Monastery. During the trekking, travelers can enjoy the excellent mountain and glacier. It is worth mentioning that if you have the time, you can walking up to the KangKyam Glacier that descends from the north face of Mt. Kailash. Then you will arrive at the highest pass (Dolma La Pass) at 5630 meters. From the Dolma La Pass, you will descend to Zultul-Puk Monastery with the altitude of 5080 meters. By the way, simple monastery guesthouses are available for travelers. The third and last stage of Mt. Kailash trek is start from Zultul-puk Monastery to Darchen, which is shorter than the previous two stages. After one-hour trekking, travelers enter the lovely Gold &Red Cliffs with stained purple, cobalt and rust walls. The Mt. Kailash trek ends. You can travel to the shores of Lake Manasarovar for one-night rest. Besides, guesthouse near Lake Manasarovar can help you allay the three-days trekking. Tips: If you are too tired to continue the trekking after two-day challenging Kora. There are 4 km to take the bus which charges 50 RMB per person. To this end, if you want a spiritual Tibet Travel, Mt. Kailash trek is a good choice. You can prepare your Tibet Travel with local Tibet Travel Agency now! Furthermore, it will be helpful to read some Tibet Travel tips. For more information about Tibet Travel, please follow our Tibet Travel Blog.